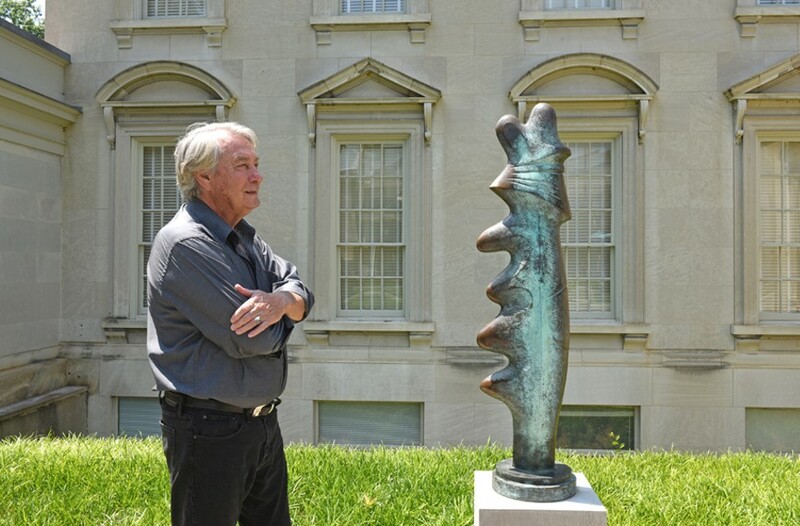 VMFA’s Sculpture Garden Welcomes Its First Virginia Artist | Arts and Culture | Style Weekly - Richmond, VA local news, arts, and events. Scott Elmquist VMFA recently installed Richmond artist Rubin Peacock’s “Untitled Totem ‘ in its sculpture garden near the Stan and Dorothy Pauley Center. Aficionados of late-20th century sculpture may find “Untitled Totem” intriguing. The 5-foot, 2-inch bronze, which was recently placed in the verdant E. Claiborne and Lora Robins Sculpture Garden of the Virginia Museum of Fine Arts, is an essay in form, coloration and abstract scratchings. Others may delight to know that it’s the only piece in the outdoor collection created by a Virginia artist, taking its place among such titans of sculpture as Dale Chihuly, Aristide Maillol and Henry Moore. For sculptor Rubin Peacock, 74, seeing his own work near the museum’s Pauley Education Center, is a flashback to an evening 38 years ago. Working on the balcony of his apartment in Pietrasanta, a small town in the foothills of the Italian Alps, Peacock began carving the maquette. He’d been drawn to the Tuscan town in the 1970s, after receiving his master’s degree in sculpture from Virginia Commonwealth University. “Untitled Totem” was then cast in 2005, using the lost-wax technique, in Peacock’s Sarasota, Florida, studio — his Richmond atelier is in Jackson Ward. The work was purchased by a fellow Richmond artist, Henrietta Near, and installed in the garden at her Fan District home as a memorial to her husband, Pinkney Near, a former head curator at VMFA. She later donated it to the museum. In 1963, after graduating from the University of Georgia, where he learned the bronze casting technique, Peacock joined the Peace Corps. Assigned to a mountainous region of Jamaica where he worked in a foundry teaching students to cast in bronze and aluminum. “I only visited a beach twice in two years,” he says.